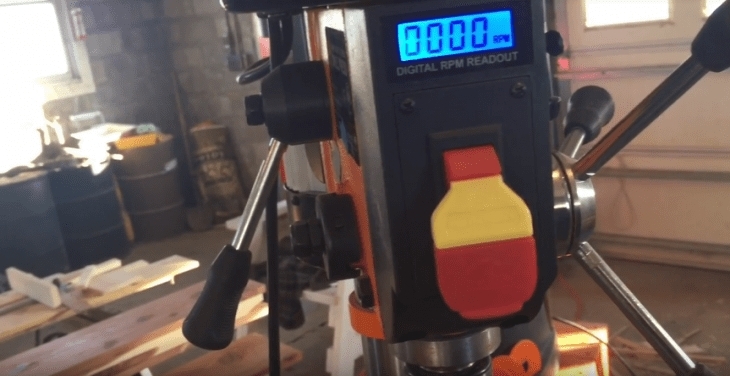 Best Drill Presses under 200$ Reviews: Top-5 in April 2019! 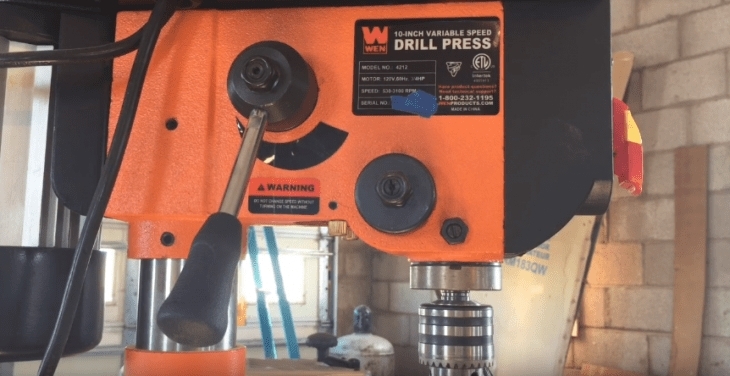 Drill Presses under $200 – Buyer’s Guide! Any tool shop, enthusiast garage and professional engineering company will have at least one drill press in their array of machines. A drill press is a very basic tool, it’s a drill fixed in place over a bench, and the drill head is lowered using pressure to penetrate the material, usually fixed in a jig. 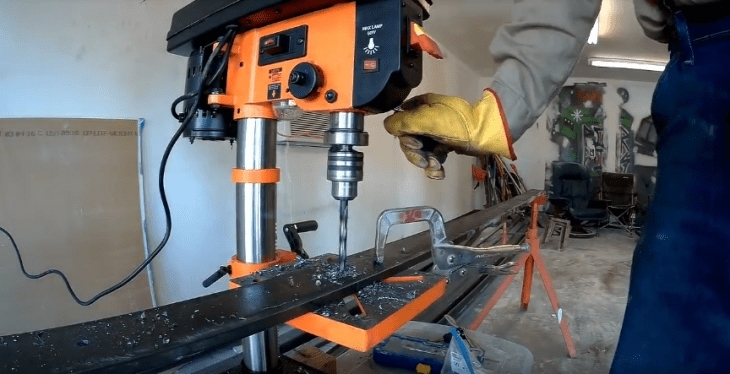 A bench-type is a drill unit that can be set upon a workbench. They are less portable that floor types and are usually used for small jobs. The Floor type unit stands in its own frame and can be moved about. It is used for heavy-duty drilling applications. The base and column hold the drill head in place, and the table is the component used for the materials, always look for cast iron or cast steel bases and tool steel alloy columns for quality construction. Drills are run on electricity, and the power of the motor is a determining factor in the success and speed of your workload. The stronger the motor, the better the performance. Speed control is essential, even if you have the biggest motor in the world if you don’t have proper speed control setting it will be hard to manage to drill safely and effectively over different types of materials, go for a minimum 5-speed control unit. Consider the size of your unit, how will it fit into your workshop, also consider the dimensions of the model you buy in relation to the distance between the head and the table. Is the table adjustable? Take into account that under $200 will limit your size. 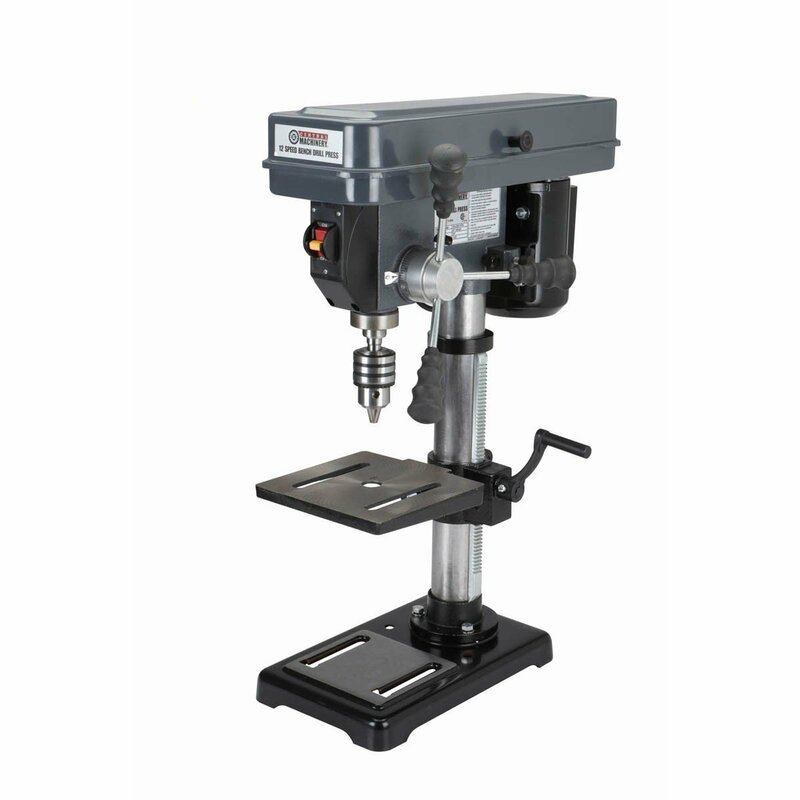 Some drill presses come with angled tables or angled heads. This means you can adjust the drilling angle, which is key to certain applications. Always make sure your model comes with an adjustable angle table. 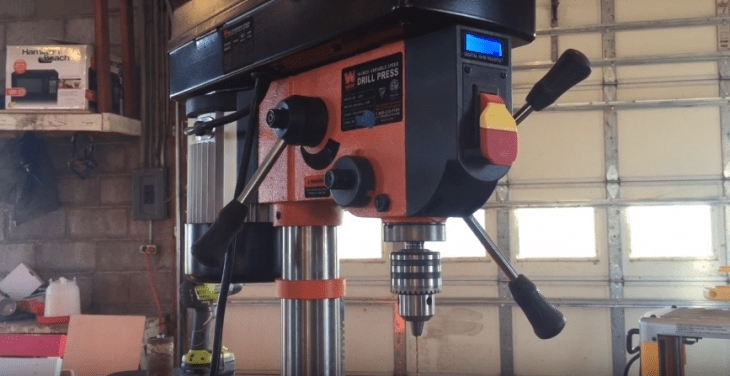 Another use for drill presses are the additional features you can use instead of a drill. Sanding, polishing, and cutting are also tools that can be used with a drill press. A Solid frame, base, and table with quality clamps. A flush base, it must be both rugged and horizontally perfect. Iron heads, which are safer and more reliable to hold the drill bits. Key tightened chuck; you do not want a hand tightened model. A depth gauge/stopper that allows you to drill accurate depths. Here are the 5 best drill presses for under $200. 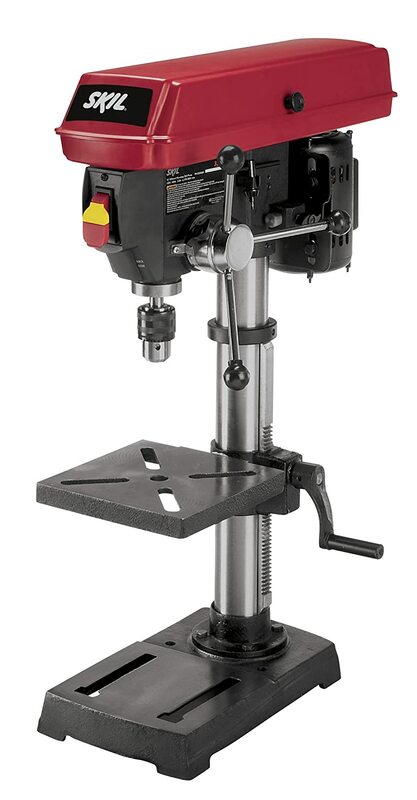 This is the WEN 4210, 10-inch 1/3HP drill press with a laser centering device. 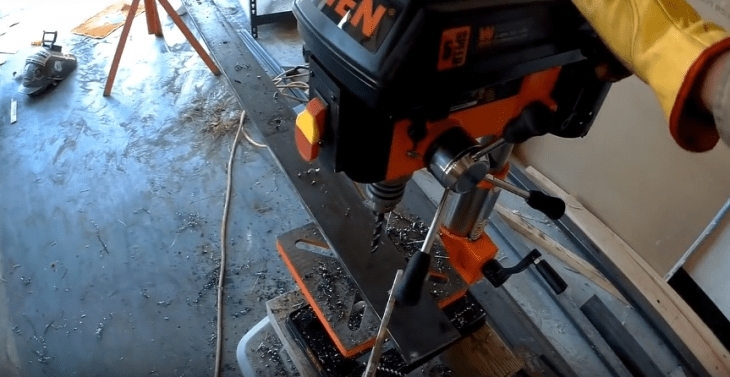 The WEN-10 is a comprehensive 10” drill press that delivers much more than you would expect from such a low-priced model. The induction motor used in this model is a 1/3HP powered by 20V, 60 Hz, 3.2A, and has a 1700RPM no-load capacity. You get five-speed settings that include 600, 1100, 1700, 2400, and 3100 RPM. The Keyed Chuck & Key is ½” with a 52mm JT33 spindle taper, and the workbench bevels 45° left and right. The chuck capacity at its smallest is 1.5mm, and its largest capacity is 13mm (1/2”), and the drilling capacity is 2 ¼”. This model comes with a Class II, 660 nm, 1 mW x-pattern laser for accurate positioning, and the height from the Floor to the top is 27 1/2″, and the height from the Chuck to the Base is 10 1/2″. This is a classic, reliable WEN model; it comes with the addition of a positioning laser that does add some accuracy and speed in the set-up. This is a bench model, so it can sit on any table you want. This is the WEN 4212; it’s a 10” drill press with 2/3HP motor and laser centering device. Like the 4210, this is the stronger version and comes with the 2/3HP motor. In this model, you get an infinitely variable speed range between 530-3100 RPMS. As you work, the system delivers equal torque, and you get a LED readout displaying the speed. The of 2-2/5 spindle travel comes with linear depth locking, so you can perform repeat jobs effortlessly. This mode comes with a 7-5/8” x 7-2/3″ cast iron worktable and includes their rack and pinion height adjustment and also provides 45° left and right bevels. The Keyed Chuck & Key is ½” with a 52mm JT33 spindle taper. The chuck capacity at its smallest is 1.5mm, and its largest capacity is 13mm (1/2”), and the drilling capacity is 2 ¼”. This model comes with a Class II, 660 nm, 1 mW x-pattern laser for accurate positioning, and the height from the Floor to the top is 36″, and the height from the Chuck to the Base is 20″. Infinite speed adjusts between 530 to 3100 RPM. If its more power and more speed control, then the WEN 4214 outperforms the 4210 model, and this would be a better buy for larger job requirements. This is another bench model that sits flush and delivers absolute perfect performance. The SKIL 3320-01 is a 3.2 Amp 10” Drill Press that gives you 5 preset speeds and accurate laser location performance. The SKIL is a woodworker’s drill press and has a 1,700RPM no load capacity 3.2amp motor, that provides you with five-speed settings of 570, 900, 1390, 2050, and 3050 RPM. The work table is 7 5/8” x 7 5/8” and comes with a bevel tilt of 45o left and right. The chuck capacity is an industry standard for this size unit and comes with a 1/16″–1/2″ (1.5–13 mm) range. This model uses a class II 1 mW and 650 nm laser for accurate alignment. 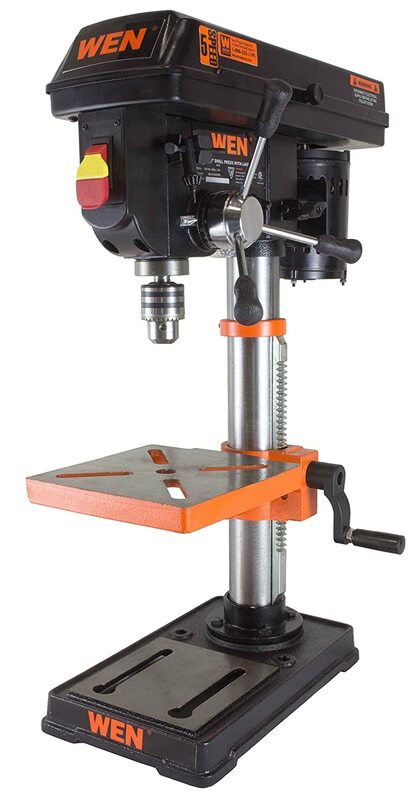 This is a classic drill press model, offers you simple and easy to use chuck with a solid table. The laser is an added benefit, and you can perform repetitive tasks with the adjustable stop feature. 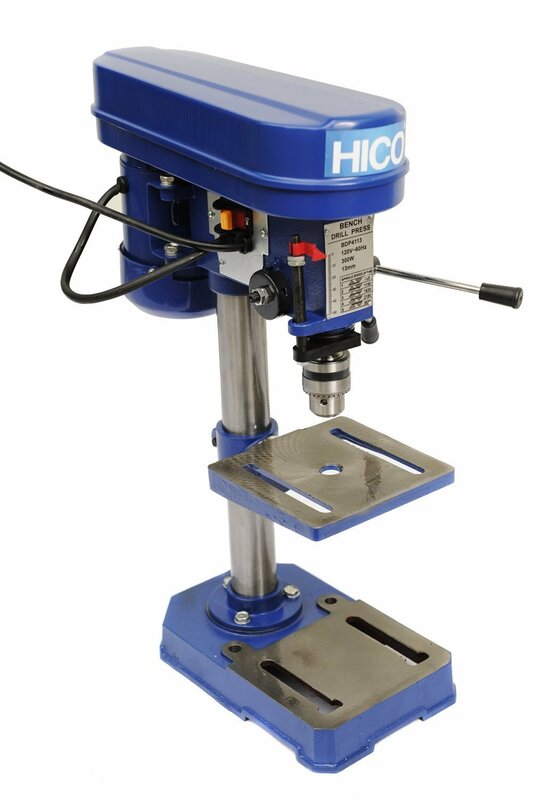 The HICO 8” drill press uses a 2/5HP motor with a 5-speed setting. The HICO 8” drill press is a very basic and easy to use model for home and beginners, it’s also a great unit to have around a workshop for quick and small job lots. This drill press comes with a 45o right and left bevel and a 2” spindle travel. The rack and pinion table allow you to adjust the height, and the design is for repetitive job performance. This model uses a 1/2″ Keyed Chuck with Key. The 5-speed settings are ranged between 760-3070 RPM. The cast iron worktable dimensions are 6-1/2” x 6-1/2”. This is one of the most basic models I have come across; essentially it’s a drill press for the time-challenged individual that just wants a hole in the material without thinking too much. Preset it once, and you just drill away all those small jobs without hassle. This is the Central Machinery 10” 12 speed, 3.85-amp motor drill press. It is rare that you get one of those ambiguous brands, ones that seem to just exist, and yet, with all the dilemma of the source, it’s a damned good drill. I tried this out and it delivers. So, while its not a well-known name brand, it is a drill press. This model delivers 6/10HP with a 3.85amp motor, so it has the power. It comes with a tilting table which is standard in this category, and with the 45o bevel you get another standard feature, the table is 7-5/8” x 7-5/8” in size and also rotates 360o for added versatility. The chuck comes with a key, and the 12 drill speed settings are 300, 370, 470, 570, 630, 690, 950, 1400, 1620, 1760, 2550, 2900 RPM. The spindle is a B16 Taper, and for repetitive jobs you have the adjustable depth stop and gauge unit. Central Machinery is a US company, located in Lexington, NC, and has been around since 1973. It’s not a well-known brand outside of the woodwork industry, but it’s an exceptionally made machine that delivers on all fronts. As you can see, all the drill presses in this article are very similar if not identical in dimensions and performance. Essentially, what you get for your under $200 is a reliable 8”-10” drill press, that will deliver constant performance if maintained properly. A word on laser sighting, this is not an expensive device, lasers are commonplace and cost under a dime to produce in China. So, when you see the “laser” don’t think you are getting something “way-out-there”. A successful laser needs to be set correctly, just like a scope on a rifle. The units in this article were all tested, and their lasers were all spot on, and that is why they are included in this list. Final words: Never buy an unknown brand, and always buy a model that has an ample source of spare parts. Sure, universal modes do use universal components, but it always helps to buy a model that has a “daddy” or “mommy” behind it. RC Tool Kits – Buyer’s Guide! Tape Measures for Woodworkers – Buyer’s Guide! Bandsaws for Resawing – Buyer’s Guide! 7 1 4 Circular Saw Blades – Buyer’s Guide!